3 Bedroom house in Panama City Beach - Gulf View Home, Luxury Beach Home with PRIVATE POOL+Spa/Jacuzzi+GAME RM+Hammock! Gulf View Home, Luxury Beach Home with PRIVATE POOL+Spa/Jacuzzi+GAME RM+Hammock! This is a 3 Bedroom, 2 Bathroom Luxury Home with a PRIVATE GAME ROOM. This Beautiful home and will SLEEP UP TO 12 GUESTS! This home has its own PRIVATE SWIMMING POOL, PRIVATE OUTDOOR 6 PERSON SPA-HOT TUB, 2 Person HAMMOCK, 3 Person SWING & PRIVATE SUNDECK in the completely fenced back yard! This home has a partial GULF VIEW! The home is located approx. 500 Feet to the beach! You can be on the crystal white sandy beach approx 3 minutes after walking out your front door! Walk to PIER PARK! Yes, Pier Park is about 1/4 mile west! Wonderful 3 Bedroom 2 Bath Home! This is a beautiful home! You can enjoy Gulf Views from the Living Room, Dining Room, Front Bedroom and partial view from our NEW GAME ROOM. Walk to the beach in approx 3 minutes and Enjoy your own PRIVATE GAME ROOM. The game room has a Regulation Size POOL TABLE, A Professional Grade FOOSBALL TABLE and a Regulation Size AIR HOCKEY TABLE, with custom beach air brush scenes on the walls! WOW, That's a great game room & it's all for just you and your friends or family! To make your vacation even more memorable just add an ELECTRIC GOLF CART to cruise around the beach area and to Shopping at the NEW PIER PARK, Only 1/4 of a mile away. Enjoy your own sundeck in the back yard! Lounge Chairs, Upscale Glass Patio Table Set, Charcoal BBQ and don't forget about the PRIVATE HAMMOCK under the palm! PIER PARK is the NEWEST SHOPPING AREA ON THE BEACH! This area is BIG! Restaurants include: Margarittaville, Red Brick Pizza Restaurant, Back Porch Restaurant, Long Horn Steak House, Bootleg BBQ, Guglielmo's Italian Grill, Hofbrau Beer Garden, Rockys South Philly Cheesesteaks, Quiznos, Panera Bread, Five Guys Famous Burgers & Fries, Camille's Sidewalk Cafe, Mable Slab Creamery, Kilwin's Chocolates & Ice Cream, Candymaker Candy Stores, Several Specialty Sweet Shops, Smoothie King, Starbucks, Ron Jon Surf Shop, Dillards, JcPennys, Target, Del Sol, Mermaid Trading Co, Southern Waters Outfitters, the GRAND 16 MOVIE THEATER & over 100 other shops! FREE Use of our $175 BEACH PACKAGE! The package includes approx 6 Beach Chairs, Beach Umbrella, Full Size Cooler & a Boggie Style Surf Board! Yes, It's FREE for you to use during your stay! Want to step up your vacation to the next level? Try renting our ELECTRIC GOLF CART! This is not for golfing, but is for cruising around the beach area! Have a great time, with the wind in your hair, cruise back and forth to the beach, shopping, out to the restaurants or over to the movie theater. Do you like to fish? Try Surf Fishing or Add a BOAT RENTAL for the week and fish LULLWATER LAKE (A 40 Acre fresh water lake) just a couple of blocks away! Relax on your own private sun deck or take our FREE BEACH PACKAGE to the Crystal White Sands of Panama City Beach! This home has a completely fenced back yard. NOW, HIGH SPEED INTERNET IS FREE! High speed internet is now avaialable. Bring your laptop, or rent one of ours, and cruise the internet in your luxury rental. FREE HIGH SPEED INTERNET! NEW! SURFBOARD RENTAL at Panama City Beach! Yes, rent one of our Ron Jon Surf Boards. PADDLE BOAT / PEDAL BOAT RENTAL. Yes, we offer 3 person and 5 person Paddle / Pedal Boat Rentals on Lullwater Lake. BEACH WAGON RENTAL. Take all of your beach items to the beach with our oversized off road wagon. BEACH METAL DETECTOR. Find lost treasures at the beach with our beach metal detector. Yes, you can beach a treasure hunter while on vacation. BIKE RENTAL. We are one of the few property owners that offer beach cruiser bike rentals on Panama City Beach! 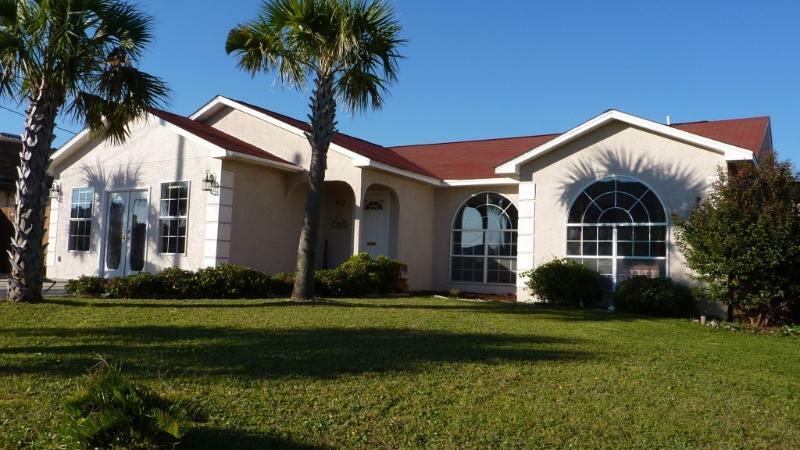 This home is BEST suited for families or adult groups wanting a more upscale and quieter area of Panama City Beach. My husband and I have taken many vacations to Panama City but this private vacation home rental was the most awesome ever! To start with the home was exceptionally clean and ready for us upon check-in. Second the neighborhood was extremely quiet and within walking distance to beach, fast food, grocery, CVS and many upscale restaurants. The pool was so clean and had a pool house that had everything including a pump for floats. No noise at night. Third, the owners were on a scale of 1-10, a perfect 10. We called them twice and they answered immediately and sent some one out to fix air conditioner in game room and program tv in living room. Nothing else was needed. Kitchen had everything we needed and more! We will book again with same property for next year and hope that anyone reading this will too. It made for a very relaxing and much needed soothing vacation. We are so happy to say this is going to be our only home in Panama to rent forever. Thank you Julie & Eric. Even our little dog of 12 pounds named Hannibal enjoyed his stay and especially taking walks in neighborhood. He met a few friends! We always rent a private condo when we go to the beach, however this year we decided to rent a house for the convenience of having a private pool. This house was an excellent choice. It had everything you could possible want and great access to the beach. It's also in a location where the beach is not crowded, so you don't have to get up at the crack of dawn to get a good spot. It's also two minutes from the grocery story and a few restaurants. The entire family really enjoyed the pool, it was a real challenge getting my 8 year old son out of it each night. The only thing I can think of as a negative, is I couldn't get the can opener to work (lol). After each vacation, I always get my kids to rate it compared to previous years. This one came in second, only to Cancun because it was all inclusive and they were waited on by waiters all day. I was reluctant to post my review, because I booked in January and was able to get the last week available for the summer. Now I will have to book a lot sooner, because once word gets out how great this place is it will be booked a year in advance. First time in Panama City Beach. We loved it. House was great! Perfect for our family and dog. Game room was fabulous! Loved it. The layout of the house was perfect. We will definitely be back and hopefully can stay longer. Owner's reply: Thank you for staying! We designed the private game room with families in mind. Glad you were able to enjoy the custom air brushed beach scenes, the arcade sized game tables and now the papasan chairs and large couch with the sleeper make this an even nicer place to vacation! This is the first time we have rented a home in Panama City. Usually we stay in a hotel. This home was perfect ---outdoor pool ---game room ---and close to the beach, shopping and restaurants. We brought our entire family this time even our pet. We all enjoyed this home and plan on returning. Owner's reply: Thanks for staying! We own all of our vacation homes and try to make every stay as perfect as possible. Looking forward to seeing you again in the future. Great location for the beach and Pier shopping. Very quiet . Nice layout of the house. Needs some minor maintenance. We had 6 adults and 2 small children, 2 dogs, plenty of room. Fenced yard worked very well for small kids and dogs. Owner's reply: Thanks for staying. This is my CLOSEST Home to the beach! Approx 500' to the beach. This home has KING Size Beds in two of the bedrooms, so the second KING Bedroom is filled up with the bed, night stands & the dresser. The Inground swimming pool is 15' x 30', probably an average size pool for a private home. We have just added a Queen Sleeper Convertible Couch to the Game Room. The home now sleeps up to 12 guests. Looking forward to your next visit. Eric & Julie, Alternative Beach Rentals. We came in with our four children. They are 15, 12, 10 and 5. The house waited for us ready. Sleeping arrangement was easy and the kids loved the two-decker beds. Game room was a saver, as we had some rainy days. Great location to see and be at all the attractions at Panama City Beach. Owner's reply: Thanks for staying! Perfect location! This is my CLOSEST HOME to the BEACH! Very Close to Pier Park (over 100 combined shops, stores & restaurants). The home now has TWO KING Beds. The view from our condo was fantastic. Great access to the beach, shopping & fantastic resturants. We enjoyed watching the sunsets over the gulf. The accomadations were great. Comfortable bed, nice furniture, clean walk in closet for hanging clothes & storage. Secure parking & easy loading & unloading. Pet walk was great & professional landscaping. We hated to leave & hope to return. Owner's reply: This private home is in a perfect location! Very close to the beach with its own private inground swimming pool and outdoor jacuzzi / spa / hot tub. This home also has a great private game room! This was a beautiful home in a great location. We loved the pool and the beach in walking distance. Had all the comforts of home. We hope to stay here for many years to come. Estimated price per night based on a weekly stay. Owner fees of $198.00 per stay may apply. Enter your dates to see the total cost.